Interested in joining the Kim lab? Currently, I have a number of undergrad and grad opportunities (see below). Click here for quick tips on how to contact me for both grad school and undergrad opportunities. In general, sending me a cover letter describing your research interests, unofficial copies of transcripts, and CV are enough to get the conversation going! 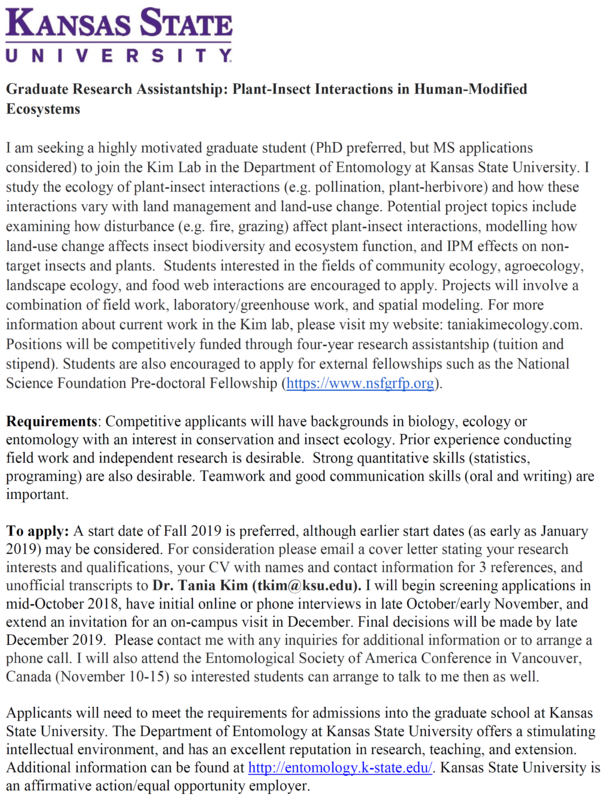 I currently have funding for a Master’s or PhD student to start in Spring or Summer 2019, or Fall 2019 (at the latest). Highly motivated students interested in landscape ecology, community ecology, plant-insect interactions, agro-ecology, or conservation, should contact me during fall 2018 for 2019 enrollment. See here for more information. I am currently looking for undergraduate students interested in participating in the following projects during the fall and winter semesters. I currently do not have funding for postdoctoral researchers but am willing to write grant proposals with prospective postdocs. Please send me an email with your research interests and information about the grant/funding agency that you would like to apply to. Here is a list of example funding agencies that support postdoc research in Biology. Many of them don’t apply to ecology, but some do.